As developers, we love and hate side projects. We love them because they are great ways to learn new tricks and to implement some cool productivity hacks. But we sometimes hate them because they can be a time-sink, especially when you need to set up new development environment, DevOps pipeline, hosting environment all from scratch. If you have just started learning coding, the bootstrapping tasks might seem daunting and they are absolutely no fun to deal with. To give you all the fun of hacking, but take away all the pain of setting up the infrastructure. Let’s see how Postverta can help you with your next side project. Postverta gives you instant and unlimited Node.js workspaces backed by full-fledged Linux containers. Creating a new workspace only takes seconds! Installing/uninstalling NPM packages is also piece-of-cake. Everything is sync’ed to the cloud so you can resume working from anywhere, anytime. To make things even easier, we provide a number of helpful templates for you to bootstrap modern web apps quickly (React, Angular, or RESTful webhooks). Of course, you can always build your custom stack by modifying the templates or starting from scratch. Writing the code is only the beginning. The next step is to publish your app and collect feedbacks from the real users. Each app you develop in a Postverta workspace is automatically hosted behind a public URL (e.g., https://hello-world.postverta.com), so you no longer need to manually deploy it to any third-party PaaS or IaaS. Update the code, restart the app, and it is live! Inspired by GitHub’s famous “fork”, you can clone any public app with just one click, in order to easily build upon what others have built. You can also clone and “re-deploy” existing apps with your own configurations (e.g., deploy a popular Slack bot with your own API keys). 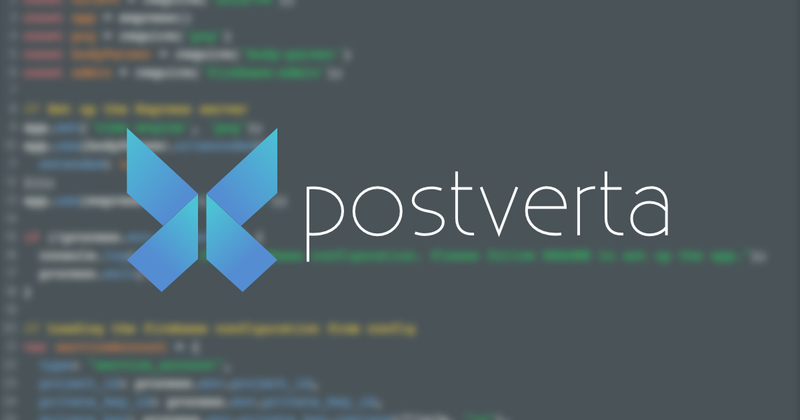 We want Postverta to be not just a tool, but also a community for people to discover new exciting stuff and learn from each other’s work. All Postverta apps are open-sourced (for now), which means people with the URL of your app can read your code. However, modern web apps usually involve runtime configs and secrets (e.g., API keys) that are considered private. We provide a special container for you to store all your runtime secrets in (like your personal .env file). The secrets are accessible from your code as environmental variables, but they won’t be shared with others. So you can host your app securely AND share your code with others at the same time. We understand at some point you might want to move your app off Postverta. That’s why we made it super easy to export and download your app as a ZIP file. The exported package can be easily deployed to other platforms. So what I can do on Postverta? Feeling adventurous? Start an app now with our templates at https://postverta.com/#getstarted, or clone an existing project. This is only the beginning, and we still have lots of features in our pipeline (collaboration, GitHub integration, code auto-completion, more programming languages). Sign up the service for future updates!